It’s been a decade since we cooked or ate Thanksgiving dinner at home. Rialto is open, and Jody could hardly ask her staff to work if she weren’t willing to shoulder up to the hot line beside them. On Thanksgiving evening we did what we always do–we had dinner at the very end of service when Jody could sit down, while the staff enjoyed their own Thanksgiving dinner nearby. One effect of eating in restaurant on a holiday is that you don’t experience the post-dinner oh-my-god-I-ate-an-entire-manatee sensation of triumph–or remorse–depending on your personal inclination. And as a consequence nobody feels compelled to rein things in at home for the next couple of days. 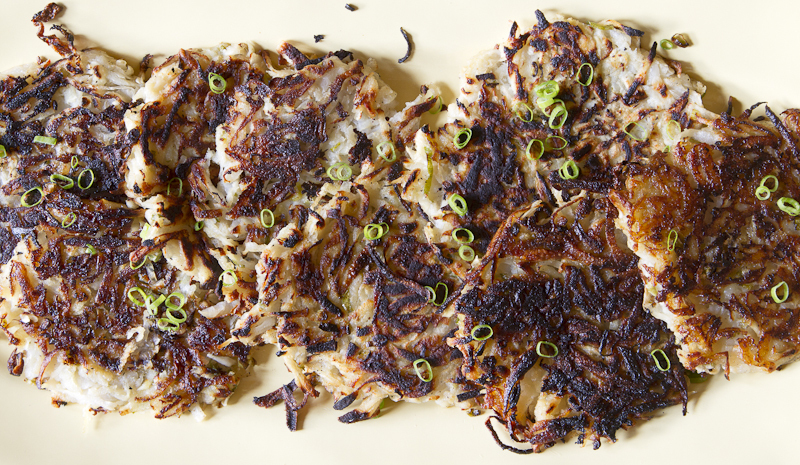 Parsnip Potato Pancakes may not seem like the height of indulgence, but they are fried. Not deep fried, but cooked with a healthy amount of olive oil nevertheless. And they are unbelievably sweet. This marked sweetness results from the transformation of the parnsip starches into parsnip sugars as the vegetable slowly matures underground. Carrots are sprinters when compared to the plodding pace of the parnsip growing season. You can’t help but wonder if the wives’ tale that parsnips harvested before the first frost are poisonous sprang up as a deterrent to pulling them out of the ground before they had time to develop their distinctive sweetness. Some farmers leave them in the fields over the winter, beneath a heavy layer of mulch, then harvest them in the spring. John Lee, of Allandale Farm, in Brookline, told me that it used to be common to harvest parsnips before the ground froze and then let them mature in the root cellar. By the spring they’d be sweet. Try to purchase medium to small parsnips (four to six to a pound). Larger ones often have a fibrous or woody core which needs to be cut out. Like carrots, they should be firm, snapping if bent. The sweetness of parsnips can be overwhelming, and Jody and I prefer them cut with an equal amount of potato. We made the pancakes a couple of different ways–without eggs, with eggs, using a little oil, using a bit more, and still a bit more. We concluded that without eggs is better than with (crispier pancakes, better flavor), and that a heavy hand with the oil is better than a light one (less sticking to the griddle). The key to successful parsnip potato pancakes is twofold: don’t grate the potato ahead of time (see Jody’s note below); and make sure you squeeze out excess moisture when forming the pancakes. The latter, along with a generous amount of oil in the pan or on the griddle, will insure that you get a nice crispy exterior, and the interior will cook faster, lowering the risk of carbonizing the outside. Dollop the pancakes with horseradish sauce and diced apple. With eggs on the side, if you wish. No need to feel guilty. You have been living on that lean Turkey Soup with Baby Bok Choy we posted last week, haven’t you? Mix the yogurt with 2 teaspoons horseradish. Season with salt and pepper. Taste and add more horseradish if desired. Refrigerate until ready to use. Peel the parsnips and potatoes. 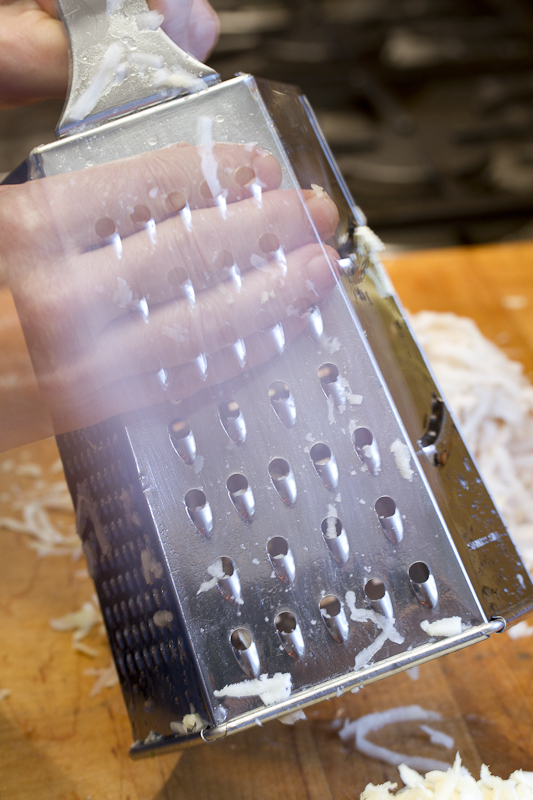 Grate each on the large holes of a box grater or the grater of a food processor. 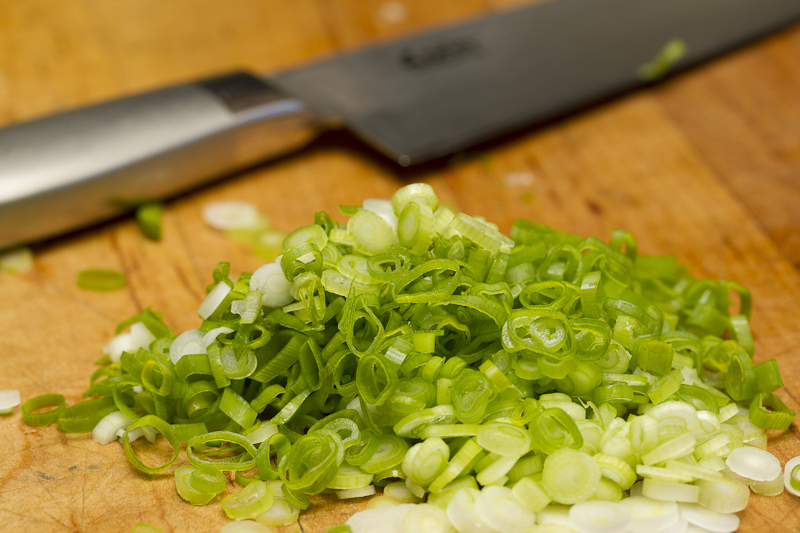 Toss with the garlic, scallions and 2 tablespoons lemon juice and season with salt and pepper. Make 12 even balls of the grated vegetables and squeeze gently to remove excess moisture. Flatten on a cutting board. Heat ¼ cup olive oil on a large griddle or skillet over medium heat. 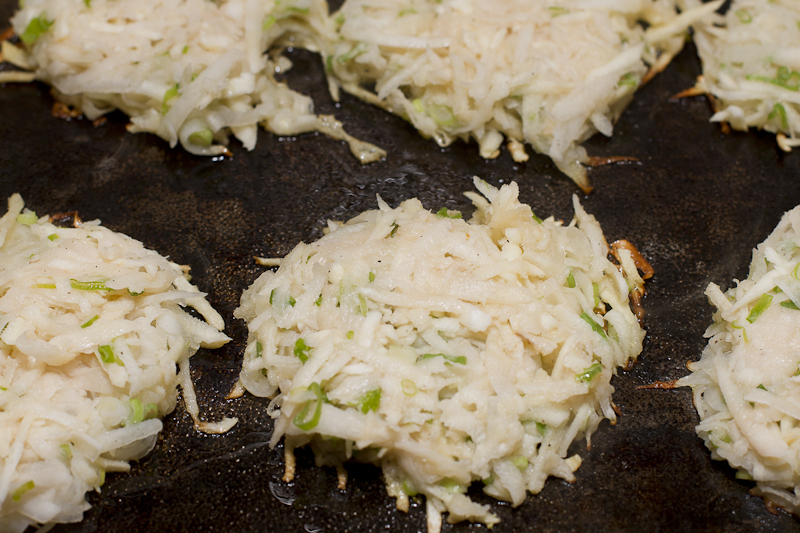 Put the patties on the griddle, flatten again, reduce the heat to low and cook 10 minutes or until golden brown, adding more oil as needed. Flip, add additional oil and cook on the second side until golden brown and the vegetables are tender in the center, another 10 minutes or so. 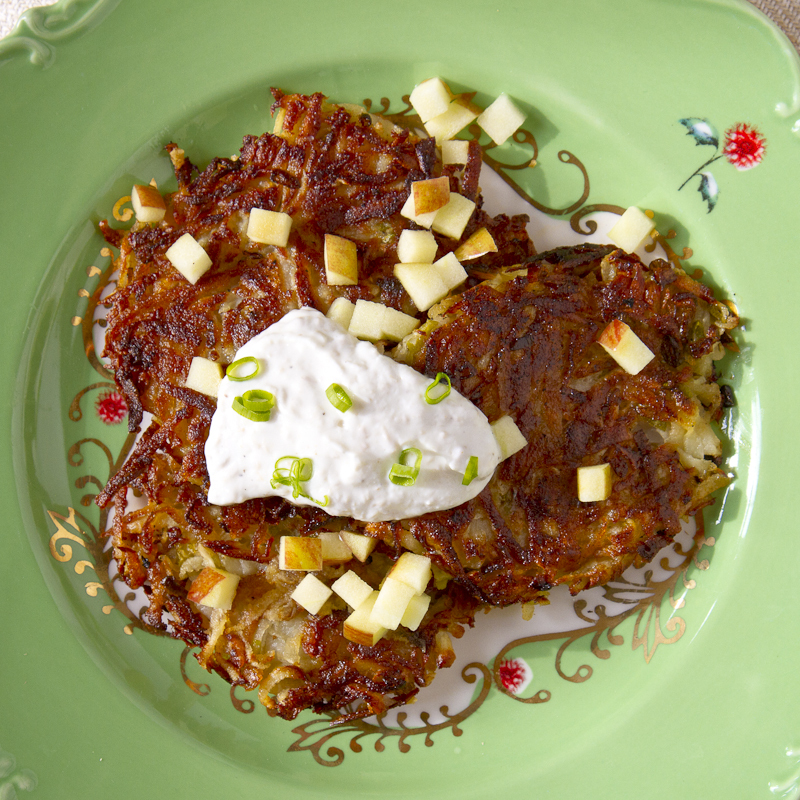 Serve the pancakes topped with yogurt, diced apple and scallion greens. You can grate the parsnips a bit ahead of time, but if you prepare the potatoes in advance they’ll start to leak, losing much of their starch essential to binding the cakes together. The trick to these pancakes is to start them on medium heat so they sear and don’t stick and then turn down the heat and cook them slowly so the outside doesn’t get too dark before the inside gets tender. Ken went shopping for the recipe ingredients and brought back 0% fat Greek yogurt!!?? Something I didn’t discover until I started prepping. Zero percent, I mean, maybe it was some valiant holiday austerity measure, but give me a break. At least go with 2%–you’ll only have a tablespoons and it tastes so much better. I grated the vegetables by hand because I prefer cleaning a box grater than a food processor. I also appreciate any opportunity for physical exercise and grating is way more of a work-out than pressing a Cuisinart button. Since I wasn’t going to make pumpkin pies today and the fridge is already bursting with leftovers, I found a new use for my impatient-waiting-for-Ken-to-finish-taking-the-pictures energy… CALISTHENICS! I did push-ups, squats, jumping jacks and a few of those backward push-ups that kill your triceps on the edge of a chair. So, what with the 0% yogurt and all that exercise, I figure the scale is back in balance after this weekend of Thanksgiving cheer. This entry was posted in Breakfast, Easy, Lunch, Vegetarian and tagged horseradish, parsnips, Potatoes. Bookmark the permalink. These sound terrific! Potato pancakes accompany almost every holiday meal in our family (OK, not passover but we do have matzah balls at almost every holiday too)…like the idea of using greek yogurt (we use sour cream) and there must be some french blood in our family somewhere because we fry them in butter. I am going to try your recipe and let you know what my family thinks.. I continue to love the blog and the (relatively) easy yummy recipes. Since potatoes have now been identified as the most recent recipient of the “most evil food” award, adding the parsnips is a good thing. Let us know what your family thinks. I CANNOT find anything but 0% in the store most of the time! Very frustrating. I recently attended the nutrition round-table at Harvard School of Public Health, and they presented their recent study of foods – what foods cause long term weight gain, and which don’t, and there is no difference between no-fat dairy and high-fat dairy. Yogurt is actually associated with weight loss over time rather than gain – so go high-fat. The biggest culprit for weight gain – potatoes….oh well, if you load them up with high-fat yogurt, maybe you’ll come out even! 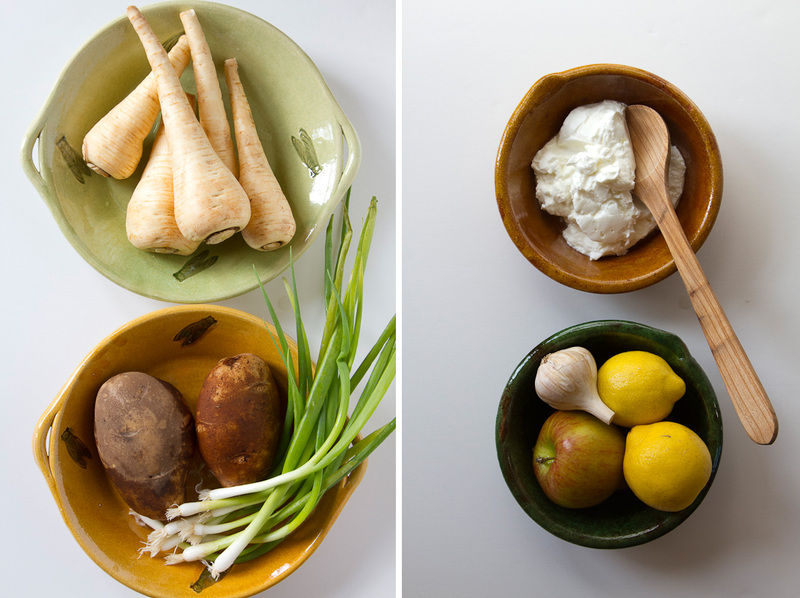 I first had parsnips only a few years ago, and while I like them I’m often unsure what to do with them (this is a common quandary for me and root vegetables)–I think they are trickier than most because, as you say, they are so sweet. I think this sounds like a great solution, especially the horseradish and greek yogurt garnish. (And great tip about no do-aheads on the potatoes, I never would have known and would just have wondered where I was going wrong). By the way, I always make full-fat, or at least 2% yogurt by the way. (Since I have it plain or with a little honey, I feel that the extra fat is balanced out by the lack of sugary flavorings). These sound and look terrific, and now that I’ve finished digesting my manatee, I’m ready to have a go at these lovelies. I NEVER cook parsnips, so this will be a great way to introduce them to the kids. Nice action shot with the grater. 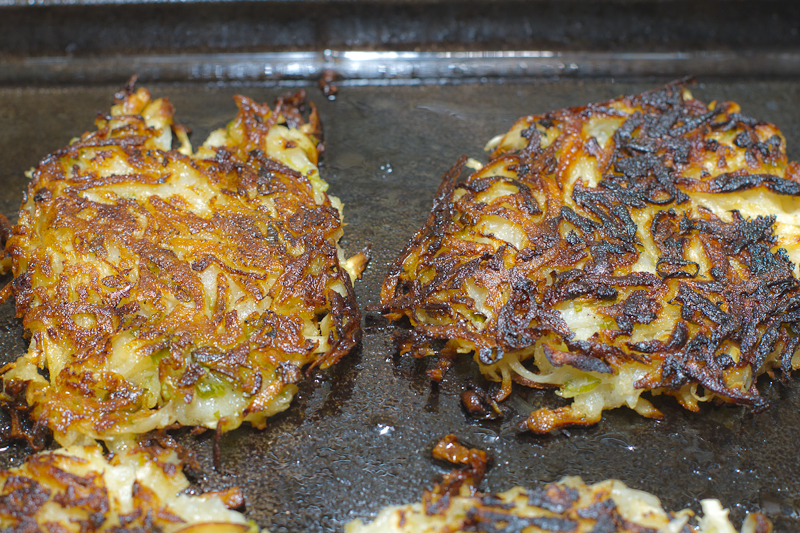 I make my Hanukkah latkes every year with grated carrots and zucchini added to the potatoes. I’ve considered parsnips, too, but I’m definitely going to try it out now! 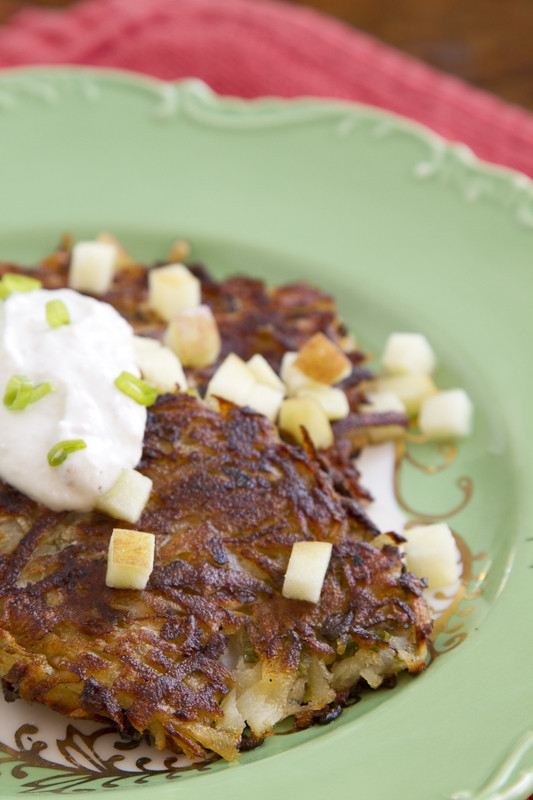 Most latke recipes do call for eggs, but they also include matzo meal, the addition of which would require a binder. I like the idea of losing the tasteless batter and focusing on crispy vegetables. I think I’ll experiment this year, with your recipe as a guide. No doubt I’ll get in trouble for tampering with the “standard.” Oh well.